Due to a Box Office hit of the latest installment of Jurassic Park, “The Jurassic World” Which the story based on a theme park with a lot of re-animated dinosaur and a hybrid T-rex. Due to this popularity of the movie, some expert or should I say edited photo or fake photo of a dinosaur has been circulating in social media world. And the most shocking of this false information, some people believes that the picture that they saw are true and believe that they still really exist. Funny, seem’s that the people that believe that they still exist? May not know the history and existence of the dinosaur, who once ruled the planet. A particular photo and perhaps the most viral photo of a dinosaur that has been uploaded in social media is the Tyrannosaurus or t-rex, in which the said dinosaur is captured and being tied down in a flat bed truck while travelling in unknown places? 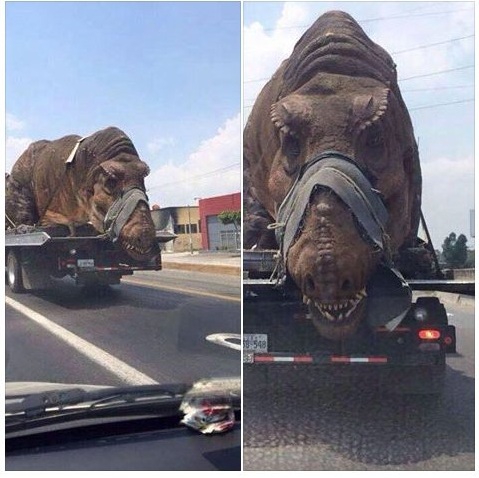 The picture gained several comments as many people has been confused and they were believed that the said dinosaur were truly exist and they should be let go to their own natural habitat, some say the people who did to this to the dinosaur should be punished because of the cruelty that they doing in the said dinosaur. Just for the record, as far as I know and what history told us, dinosaur do not exist on present day! They are billions of years gone. a devastating impact of asteroid that hit the Planet Earth that caused all dinosaur to be extinct. That’s what the history tell us? Otherwise if that’s not true? And tomorrow will see a true dinosaur walking down the street? Who knows? Many extinct animals has been declared extinct but some reports that they still seen in present day? Expert sometime gives false information? Just like these dinosaur, who we believe that they truly extinct and yet maybe they still exist and just hiding somewhere? Today, dinosaur can be seen on alive on movie and in some museum where their fossils are being displayed. 2 comments to ''Viral Photo Of A Tyrannosaurus rex, Confused People Of Their Existence"
ddino'd do exist today . Crocs and gators are one , giant snakes and even the Navy thinks they have proof of a megladon shark . if you see one on a truck , good chance it's just a machine being transported to a park .